This photo was taken in Siem Reap, Cambodia where I spent three months exploring temples and Cambodian culture while seeing clients, writing my blog and experiencing my own healing journey. I loved wandering through the little villages and being greeted by warm and inviting people. I have found friendly reception the whole world over and I encourage you to pursue your dreams-- no matter where they lead. This photo was taken in Zagreb, Croatia in June of 2018. Here's a little backstory: In March of 2018, Spirit called me to Mount Pelion, a beautiful mountainous region of Greece. I found an abandoned puppy there, fell in total puppy-love with him, and now, he (Apollo) and I are living and learning in Fiesole, Italy. I train Badass Butterflies to build exciting and profitable online Spiritual Life Coaching and Healing businesses. 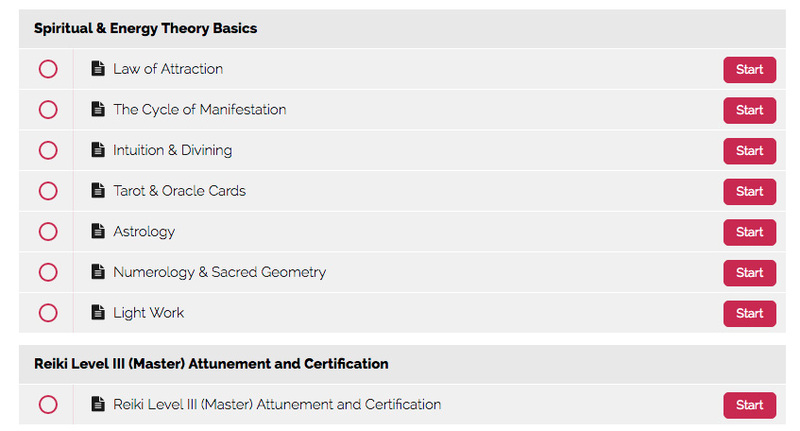 Learn all about my Spiritual Life Coach Certification below and book a complimentary Discovery Session to talk to me in person. Download my "12 Vital Steps to Launch Your Spiritual Life Coaching and Healing Business"
Please book in for a complimentary Discovery Session to discuss the details, and ask any questions that you may have about the program. Please note that while booking, there is an short, but important intake form that you will need to complete which will help us both prepare for the Discovery Session. Incomplete forms or answers without your careful contemplation will not be considered for the session, and the session will be canceled with this reason. I am happy to give you as much time as you need during our Discovery Session and I am most excited to work with folks who value energy and understand the significance of this venture. I started using the phrase Badass Butterfly a couple of years ago because it described beautifully the transformation process that spiritual healing takes us through. Caterpillars are awesome, but they are earthb-bound and limited by their circumstances. Butterflies, on the other hand, have gone through a powerful transformation process and then had to use their inner strength to break free from the cocoon. This in and of itself is totally BADASS. My beautiful tribe members allow me to guide them through this transformation process and it is truly an honor. For me, Spiritual Life Coaching is not just a job, it is a way of life. I've developed my Badass Butterfly Spiritual Life Coach Certification program with love and attention to detail so that you not only become a powerful coach, but you become an empowered being... a Badass Butterfly in your own right. To participate in this program, you need only a burning desire to give birth to your authentic self and to help others do the same. The program is comprehensive and takes about ten months to complete. This includes your own course of therapy to help you heal yourself and step definitively into your role as healer. Actually, it's really important to understand that in this certification program, healing yourself is the key component. A Badass Butterfly is badass because they do the inner work needed to create change in the outer world. In my own life, spirituality is Reality. My life revolves around spiritual principles, not as a religion, but as a way of being. My relationships, my body, my mind, my business (EVERYTHING) is about Spirit and Unconditional Love. This is important for you to understand, Dear Reader, because if my coaching certification looks interesting to you, you'll need to know that you will be diving DEEPLY into Spirituality and healing. You do NOT have to be perfectly healed to be a powerful coach (thank God/Goddess!) but you do have to be willing to be knee-deep in the work. This is not a program that will just help you start a business. This is not about cutesy clichés. This is a channeled program that is going to help you dive deep into your Being to find your dark parts and your light parts and weave them together into a purposeful, awakened life... and a powerful business that serves you and your tribe. I desire to work with people who desire TRUE authenticity-- not ego based drama, but honest-to-goodness SOUL. I desire to work with people who want to tear down their walls, peel away their masks and live with an open heart. I'm not saying it's easy to get there. But having this as one of your core desires will help you thrive this program and in my opinion, will make you an outstanding coach. If this is you, then I want to work with you! In my Spiritual Life Coach Certification, you will learn about spiritual principles and emotional wellness techniques that change the entire landscape of a person's emotional state. Shadow Work is one of the most important tools in my toolbox and I love taking my clients through it because it sheds so much light on what was hidden in their subconscious. This is real healing that we are facilitating, friend, and the results are marvelous. It is my absolute pleasure to watch my clients light up with joy at their awakenings, and it is awesome to see them take giant leaps in their lives as they learn to heal their wounds and let go of their fears. What's truly awesome is that I get to take you through it and then you get to pass it on to your tribe. My Spiritual Life Coach Certification program also includes complete certification as a Reiki Master so that you can offer hands-on healing, distance healing, and teach Reiki to other people. My certification program also automatically enrolls you in my Business Concept Coaching for the Heart-Centered Entrepreneur program, which I have created to help you birth a real-life business plan, build a website, establish a presence in social media and create a powerful and effective marketing strategy. You will come out of this program ready to work with clients on your books! To deliver you the program, I use a combination of private one-on-one sessions, group and video sessions to help you become a powerful coach. All sessions are done online and are recorded so that you can replay anything that inspires you. Remember, you don't have to be perfect and healed to help others. But you do need to be authentic and honest with yourself about your own values and desires. You have to walk the talk. This helps to foster sincere empathy and will protect you as you open up and share your Spirit with others. We will meet once or twice per week, depending on where you are in the program. During the video series, you you will be emailed a link to a video that gives that specific teaching. You should watch the video and do the assignment that comes along with it. During your first several weeks of the program, you will be receiving your own personal coaching from me. This is important so that you know the work, not just intellectually, but practically. This is also your opportunity to receive spiritual empowerment, clarity, and healing to move forward with all your dreams and goals. After you have finished your first round of personal coaching, you will be registered for the group coaching sessions. During these weekly sessions, you are encouraged to ask questions about anything that is coming up for you in your work and in your personal healing journey. These group sessions are important for many reasons. They give you the opportunity to learn from other students and to get new perspectives that may not have come up in our personal time together. The group work helps you to learn about the different issues your potential clients will present. You will be learning how to tackle those issues and discovering any blockages in yourself along the way. Also, the group calls build community. When you are embarking on the journey of healing and business, you need support, friendship and peership. Our group work will help you build relationships with Soul... and gosh! You may even find that you are connecting with Soulmates! We will be meeting over the course of ten to twelve months. At the end of that time and upon completing all the modules, assignments and assessments, completing a five client practicum and the Business Concept Coaching Module, you will be awarded an official certification that will let you set-up your Spiritual Life Coaching practice with confidence. You also have the option to deepen the scope of your work with me and take on more learning around spiritual principles and laws by enrolling in one of my mastermind programs. You can continue reading below about the program, or you can book in a complimentary Discovery Session and talk to me in detail about what you desire for your vision and what my program offers. To register or learn more about the Spiritual Life Coaching program, please book in for a complimentary Discovery Session with Crystal Lynn Bell to discuss the details, and ask any questions that you may have. "Crystal Lynn is an amazing woman with a beautiful soul and a genuine desire to use her gifts to help other people." “I really enjoy myself during all this time while learning the skills of coaching. Each lesson is clear and easy to follow. Unbelievable, it makes me so inspired! " "12 Vital Steps To Launch Your Super Powerful Spiritual Life Coaching and Healing Business"
In the mini-manual you will get the steps I took to make my online Spiritual Life Coaching and Healing business a success. Here you will get the key components you need to start your own business without making the mistakes I did. Beloved Reader, you have a vision of what you want to contribute to the world. If you are seriously determined to make it real, then nothing will stop you from achieving it. Your vision may or may not be perfectly clear right now, but if you are serious about honoring your calling, then this might just be the right program for you. Personally, my own vision has been to master my energy and create great works in the material world. I am highly intuitive and I live in the moment working with my Spirit Guides to determine every decision of my life. I do the same thing in determining the pricing for my students in the program. I am in service to Spirit and I follow my Heart's guidance. My Spiritual Life Coach Certification is not about my ego or my 3-dimensional self. Those are illusions and I do not serve the illusion. I am here to turn out a powerful team of Earth Angels who are going to serve our sisters and brothers and Mother Earth, and who are going to THRIVE spiritually, emotionally, intellectually and materially while they are doing it. This way of working is 100% Authentic to my Sacred Purpose. It is how I am guided to work my business and it serves me beautifully. It is in the moment, surrendered and trusting. Money is not an issue for me, although I do understand that it might be for you. Please note that if you decide to sign up for the program, you are in no way obligated to set your business structure in this way! I am happy to help you establish traditional pricing structures that also grow profitable businesses. In the certification program, you get to decide what route works best for you and you will have 100% of my support in your decision. But personally, I am working in a New Earth paradigm and it is my job to serve Spirit according to the higher principles of Trust, Surrender and Unconditional Love. So I have been called to offer pricing based on Source’s guidance ONLY. So, Precious One, if you would like to know the investment of this program, book yourself in for a complimentary Discovery Session. To register for the Spiritual Life Coach Certification program, please book in for a Discovery Session with me to discuss the details, and ask any questions that you may have. My Spiritual Life Coach Certification program is designed for people who want to facilitate meaningful change at the level of the Soul. This is not a crash weekend course that stuffs you full of generic theory. This is a course that initiates you into the holistic lifestyle of peace, connection and Unconditional Love. Even though we can address practical issues around career, relationships, self-esteem, lifestyle, talent, health and fitness, the work of a Certified Spiritual Life Coach always begins on the inside. We use what we see in the physical world to help us understand what is going on with our emotions, our beliefs, any blockages that may be present and also to uncover any hidden strengths and talents. Then we work to unblock the Divine Light and help the outside, material world respond to our client's Soulful Truth. I call this living life from the inside out: We explore our inner world, heal it, nurture it, and facilitate meaningful transformation. Our job, during this program, is to prepare you to give you a practical approach to coaching and the training to launch yourself as a Certified Spiritual Life Coach who can help bring a person to balance and help restore their dignity and self-esteem. And of course we must make sure that you ahve a proper business plan, blog and functioning structure in place by the time you leave the program. Becoming a certified Spiritual Life Coach with me will prepare you for a rich and rewarding career as coach, mentor, teacher, healer and guide. It is not just a job, it is a lifestyle that affects your entire being! The possibilities of what you can do as a certified Spiritual Life Coach are endless! From coaching individuals privately to small groups, to facilitating workshops and retreats around the world, to writing blogs, articles, books to being a guest speaker, lecturer and authority in your area of expertise, being certified as a Spiritual Life Coach is powerful. 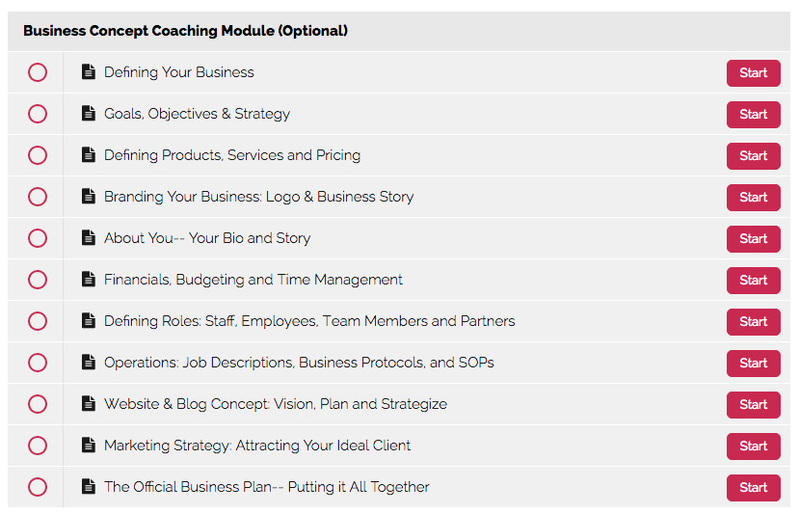 A business and blog building module that will help you vision, structure and create a complete business plan and website that is ready to showcase you as a coach and attract your ideal clients. When you are finished, you will have a complete business model that you can use to serve your own clients without having to reinvent the wheel! You don't need to be spiritually or emotionally perfect in order to be a coach, but you must be willing to do the work to open your heart and mind and maintain yourself as a channel of Unconditional Love and healing for yourself and others. This is a process and a practice, not a perfection. You already have the potential to be a powerful servant of Divine Light. You're already doing it, although you may not be aware of it. Certification will help you awaken to your gifts and help you bring them to those in need in a systematic way that lets your clients feel like they are safe in your hands. It is your own Spiritual journey that qualifies you most for this work. Most spiritual coaches and teachers are highly aware of their own emotional issues and it is because of these that they are passionate about sharing their insight and knowledge with others. Being a Spiritual Life Coach is more than just a collection of knowledge and principles. It is about having walked through a myriad of trying experiences and having come out on the other side an appreciative and awakened person. This does not mean that you are free from dark and negative emotions and never experience those feelings. NO. In this approach, your job is to learn to embrace life unconditionally. The basis of our work is Unconditional Love and Radical Self-Acceptance. As we develop these for ourselves, we become better able to share with and teach this to other people. Because of this, a significant part of your coaching certification involves taking your own deep healing journey with me as your coach and guide. The goal here is not to perfect yourself, but to learn about yourself at a profound spiritual and emotional level and to apply the principles and tools of spiritual empowerment to yourself. This will help you develop your intuition and empathy and use them expertly with other people. Empathy is our greatest teacher. Intuition is our tool. Many people who are called to this work are natural empaths. An empath is a person who feels the emotions of other people deeply. Untrained, an empath will take on other people's emotions and make them their own, thus experiencing moodiness, anger, depression and even anxiety that they can't really explain. Empathy is a key tool in our Coach's toolkit. It is exactly because of our natural sensitivity that we can help people transform themselves and it is through our Intuition that we can find the Divine path and directives. Intuition is our ability to know something without formal teaching. It is natural to everyone, but some of us have a more developed relationship with it than others. Part of our work as healers, coaches and mentors is our ability to use our Inner Knowing to 'see' people and situations. Your training as a Spiritual Life Coach will involve getting very intimate with your intuition and developing a relationship with your very own Spiritual Guidance System. Please book in for a complimentary Discovery Session with Crystal Lynn Bell to discuss the details, and ask any questions that you may have about the program. Are you considering becoming a Spiritual Life Coach? +393319135899 Find me on Whatsapp!